According to my Facebook feed, it would appear that Daylight Savings Time is universally loathed in North America*. I actually like it a lot, despite accidentally oversleeping today (I blame my new super duper pharmaceutical strength allergy drugs and the fact that I haven’t slept well for about 3 weeks) and having a pile of work that has filled my conscious and subconscious thoughts for the past week or so. 1. Goodbye to Headlamp Harvests. And headlamp watering. And headlamp yard cleaning up after the 3G Network on Garbage Night Eve. Since I get home from work after 6 pm on a good night, I’m often out mucking about in the Urban Farm when it’s dark. The solar lighting helps somewhat (thanks, Bruce! ), but it’s still not as nice as being able to see what’s going on until 9 pm or so. 2. Happier plants. Longer days equal more sunlight. More sunlight equals better, faster growth so that when the temperatures turn North Texas into the surface of the sun (July through September), the spring crops should be harvested and I’ll only be stressing about keeping the fall transplants alive. 3. Better visibility for the 3G Network. Guinness, Godiva, and George prefer days with two long walks. Guinness usually insists upon them. I, on the other hand, am afraid we’ll all die if we do our walks much past dusk, despite light colors and a flashlight to show oncoming traffic where we are. A lot of our walk route does not have sidewalks (our street for example) so I fear the happy hour revelers, the soccer moms, the late for dinner parents, and the senior citizens returning from early bird dining. I’m a much happier walker when it’s light (or when no one is awake at 5:30 am). 4. Patio action. Until North Texas becomes the surface of the sun, it’s awesome to gather up friends, sit outside, and sip something refreshing. Sometimes this also involves a swimming pool if the gathering isn’t at our house. If it does, it’s better to have a longer day so the water is warmer and more people will get in. (I don’t mind what the water temperature is as long as there’s a towel waiting for me. Neither does Godiva.) If it’s at our house, there will be lots of dogs running around since our visitors know to BYOD (bring your own dogs) because the backyard minus the Urban Farm is a dog park. And “Uncle” Bruce usually is planning to smoke/deep-fry/grill something dog-friendly. 5. Flowers galore. I’ve stopped buying cut flowers even though I love them. When it gets warm here they just do not last. And I like flowering plants because they usually keep giving you more flowers if you remember to water them. But in spring about this time of year, everything that flowers is. The only parts of me that minds this are my nose, eyes, head. Damn you allergies. 6. Trees with leaves. 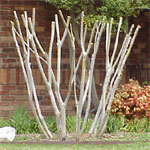 There’s nothing uglier than a crape myrtle without leaves. It looks like a pile of bones standing upright on the grass. It looks dead and uninviting. And then the local landscapers decide to decapitate it and it looks like an awkwardly trimmed pile of bones. 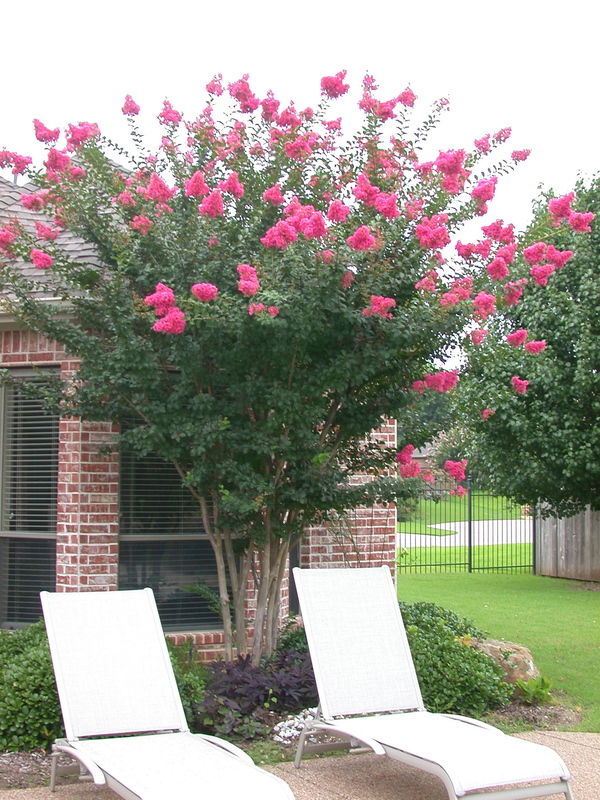 I’m glad to see leaves popping out on trees of all kinds, but especially crape myrtles. 7. Green grass. Although it doesn’t get all that cold here and only snows on important days like Christmas Day or when the Super Bowl’s being played in town, our grass goes dormant. It looks like straw from November until now. By the time I get back from my business trip this week, I’m hoping all the grass will be Ireland-green. 8. Rain. It’s a problem around here. We don’t get enough and when we do get some, it’s like God’s just pouring a bucket on the whole area and it just runs off. So I look forward to this time of year to fill the rain barrels, decrease the chances of drought, and make my friends with boats happy. Because you know what they say about boats: the best thing about boating is having a friend with a boat. 9. Happiness. Despite it never really staying dark, gray and gloomy around here for long, when it does, my coworkers aren’t as fun to be around. Everyone gets a bit down in the dumps. I think it’s because most people after living here for a while don’t like wearing socks. Last night at dinner one of my friends who is a native Texan explained how he feels happiest when he is wearing flip flops and shorts so even if it means being a little cold or wearing a sweatshirt when it’s windy or cold, he does it. 10. Pedicures and sandals. Open toe shoe season means that feet need to look pretty says the gal who desperately needs to head to the nearest nail salon. Even if you’re a dude. It doesn’t make you metrosexual, men friends, it just means that your feet will be presentable and clean. Ladies, even if you don’t let your feet experience a professional’s touch, lotion and polish will make your sandal wardrobe look even better. And as you dust off your sandals, be sure to be ruthless. Even if you love them, worn out shoes don’t do your body any favors. *Except for Fransi at Three-Hundred Sixty-Five. She actually used the word “Hallelujah!” in today’s post referencing Daylight Savings Time. I agree with her 100% as you can see. This entry was posted in Sow and tagged 3G Network, bruce, crape myrtles, daylight savings time, dogs, flip flops, fransi weinstein, garden, gardening, George, Godiva, grass, Julie Petroski, leaves, Mortroski Midcentury Urban Farm, pedicures, rain, sandals, sow, Texas, three hundred sixty-five, water, weather. Bookmark the permalink. As well as 3G time Julie don’t forget the ME time. Lol. Blogging is me time! It helps me relax. And so is urban farming time. It is sweet of you to remind me though. Believe me, I do relax. I guess the blog is making my life seem hectic! Lol. I’m getting a pedicure and brushing upon on my Emily Post before I see you in April, Laura! I’m looking forward to pedicures and sandals too! I have a Crepe Myrtle in my yard here in Austin, TX. I never trim it down…It seems happy, but maybe I should look into decapitating it? NO! It’s terrible for the tree. Leave ’em be and they bloom better. It’s a myth that you need to prune them every year. They should be pruned like other trees but not topped like many “landscapers” do in Texas to keep them small. DST is universally loathed?? How is that possible? How could anyone not want longer days? I am gob-smacked!! Thanks for the shout-out btw. I think everyone is dwelling on the 1 hr of missed sleep (I got at least 2 extra hrs today) and dark wake up (again, not a big deal since it’s always dark at 5 am). Bring on the sun! I love it. I was much happier this morning despite the water heater incident. I’ll tell you about it later, perhaps in tonight’s post.